Streaming is eating radio: Younger audiences are abandoning radio for streaming. Just 39% of 16-19-year olds listen to music radio, while 56% use YouTube instead for music. Gen Z is unlikely to ever ‘grow into radio’; if you are trying to break an artist with a young audience, it is no longer your best friend. To make matters worse, podcasts are looking like a Netflix moment for radio and may start stealing older audiences. This is essentially a demographic pincer movement. Streaming deflation: Streaming music has allowed itself to be outpaced by inflation. A $9.99 subscription from 2009 is actually $13.36 when inflation is factored in. Contrast this with Netflix, for which theinflation-adjusted price is $10.34 but the actual 2019 price is $12.99. Netflix has stayed ahead of inflation; Spotify and co. have fallen behind. It is easier for Netflix to increase prices as it has exclusive content, but rights holders and streaming services need to figure out a way to bring prices closer to inflation. A market-wide increase to $10.99 would be a sound start, and the fact that so many Spotify subscribers are willing to pay $13 a month via iTunes shows there is pricing tolerance in the market. Catalogue pressure: Deep catalogue has been the investment fund of labels for years. But with most catalogue streams coming from music made in this century, catalogue values are being turned upside down (in the streaming era, the Spice Girls are worth more than the Beatles!). Labels can still extract high revenue from legacy artists with super premium editions like UMG did with the Beatles in 2018, but a new long-term approach is required for valuing catalogue. Matters are complicated further by the fact that labels are now doing so many label services deals, and therefore not building future catalogue value. Labels as a service (LAAS): Artists can now create their own virtual label from a vast selection of services such as 23 Capital, Amuse, Splice, Instrumental, and CDBaby. A logical next step is for a 3rdparty to aggregate a selection of these services into a single platform (an opening for Spotify?). Labels need to get ahead of this trend by better communicating the soft skills and assets they bring to the equation, e.g. dedicated personnel, mentoring, and artist and repertoire (A+R) support. Value chain disruption: LAAS is just part of a wider trend of value chain disruption with multiple stakeholders trying to expand their roles, from streaming services signing artists to labels launching streaming services. Things are only going to get messier, with virtually everyone becoming a frenemy of the other. Tech major bundling: Amazon set the ball rolling with its Prime bundle, and Apple will likely follow suit with its own take on the tech major bundle. Music is going to become just one part of content offerings from tech majors and it will need to fight for supremacy, especially in the ultra-competitive world of the attention economy. Global culture: Streaming – YouTube especially – propelled Latin music onto the global stage and soon we may see Spotify and T-Series combining to propel Indian music into a similar position. The standard response by Western labels has been to slap their artists onto collaborations with Latin artists. The bigger issue to understand, however, is that something that looks like a global trend may not be a global trend at all but is simply reflecting the size of a regional fanbase. The old music business saw English-speaking artists as the global superstars. The future will see global fandom fragmented with much more regional diversity. The rise of indigenous rap scenes in Germany, France and the Netherlands illustrates that streaming enables local cultural movements to steal local mainstream success away from global artist brands. Post-album creativity: Half a decade ago most new artists still wanted to make albums. Now, new streaming-era artists increasingly do not want to be constrained by the album format, but instead want to release steady streams of tracks in order to keep their fan bases engaged. The album is still important for established artists but will diminish in importance for the next generation of musicians. Post-album economics: Labels will have to accelerate their shift to post-album economics, figuring out how to drive margin with more fragmented revenue despite having to invest similar amounts of money into marketing and building artist profiles. The search for another format: In 1999 the recorded music business was booming, relying on a long established, successful format that did not have a successor. 20 years on, we are in a similar place with streaming. The days of true format shifts are gone due to the fact we don’t have dedicated format-specific music hardware anymore. However, the case for new commercial models and user experiences is clear. Outside of China, depressingly little has changed in terms of digital music experiences over the last decade. Even playlist innovation has stalled. One potential direction is social music. Streaming has monetized consumption; now we need to monetize fandom. The IFPI today announced its annual assessment of the size of the global recorded music business. For the first time in a long time the music industry has been able to announce a significant growth in revenue: 3% up on 2014 to reach $15 billion. Except that the growth isn’t quite what it first appears to be. In fact, the IFPI reported $15 billion last year for 2014, and for 2013 too. So on the surface that appears to actually be three years of no growth. The IFPI has done this before. For example, it had previously announced a small 0.2% growth in 2013 (which was the big headline of the numbers that year). But it then downgraded that to a small decline the following year before then upgrading it to a small growth again in 2015. The IFPI explained that they have retrospectively downgraded their 2014 number to $14.5 billion to reflect some changes in the way they report performance royalties (a minor revenue impact) and, more importantly, to create ‘constant currency’ numbers i.e. to try to remove the impact of currency exchange fluctuations. That approach works well for company reports but less well for the macro picture. The IFPI have to report this way as they are essentially summing up company reports, however when we are talking about global macro markets we run into difficulties, for example looking at music revenue as a % of GDP etc. The approach also has the effect of generating very different growth rates. For example, if we assume that the top 10 music markets each grew at 3% in local currency terms in 2015, using the exchange rates the years took place (i.e. 2014 USD to local currency and 2015 USD to local currency) there would only have been 0.48% growth in US dollar terms. If, however, we take the constant currency approach we see 3.2% growth. When we are talking about individual companies there is a lot of value in reporting at constant currency rates as those companies are dealing with repatriating and recording revenue from across the world into their local reporting HQs. But when we are talking about global markets comprised of many local companies (e.g. the vast majority of South Korean and Japanese revenues stay in local companies so are not directly shaped by currency fluctuations) the methodology is less useful. The cracks really begin to show when you take the long view. For example if we went back 5 years with constant currency rates the value of the music business as a % of the global economy would be over stated. Downloads and physical still both falling: Download revenue was down 16% while physical was down 4.5%. The physical decline was lower than the 8% decline registered in 2014 and played a major role in helping total revenues grow. If physical revenue had fallen at the same rate as 2014 there would have been $0.25 billion less revenue which in turn would have brought total revenues down into decline. The Adele factor can once again be credited for helping the industry out of a sticky patch. The download decline was more than double than in 2014 (6.6%) and that drop is accelerating in 2016, with Apple Music playing a major role in the cannibalization / transition trend (delete as appropriate depending on your world view). What is clear is that downloads and subscription growth do not co-exist. Though it is worth noting that the move away form purchase and ownership is a bigger trend that long preceded Spotify et al. Ad supported revenue fell: Ad supported streaming revenue was just $0.634 billion in 2015, down very slightly from $0.641 billion in 2014. YouTube obviously plays a role, and that was a key part of the IFPI’s positioning around these numbers. You’ll need to have been on Mars to notice the coordinated industry briefings against YouTube of late, and these numbers are used to build that narrative. But YouTube is far form the only ad supported game in town, with Soundcloud, Deezer and Spotify accounting for well over a quarter of a billion free users between them. Also, the IFPI doesn’t count Pandora as ad supported, one of the most successful ad supported models. Then there are an additional quarter of a billion free users across services like Radionomy, iHeart and Slacker. So the music industry doesn’t just have a YouTube problem, it has an ad supported music problem. Streaming ARPU is up but subscription ARPU is down: The net effect of streaming users growing faster than revenue is that subscriber Average Revenue Per User (ARPU) fell to $2.80, from $3.16 in 2014, and $3.36 in 2013. Ad supported ARPU was down from $0.10 to $0.08 while subscription ARPU was down. The fall in subscriber ARPU is down to a number of factors including 1) discounting, 2) bundles, 3) churn, 4) growth of emerging markets services such as QQ Music (monthly retail price point $1.84) and Spinlet (monthly retail price point $1.76). For a full list of emerging markets music service price points check out the MIDiA ‘State Of The Streaming Nation’ report. The irony is that the major record labels are increasingly sceptical of mid tier price points yet they have inadvertently created mid tier price points via discounted pricing efforts. Total blended monthly streaming ARPU for record labels was $0.37 in 2015. And if you’re wondering how ad supported and subscription ARPU can both be down but total ARPU up, that is because subscriptions are now a larger share of total streaming revenue (up to 78% compared to 71% in 2014). So the end of term report card is: an ok year, with the years of successive decline behind us, but long term questions remain about sustainability and the longer term impact of incentivized growth tactics. Zombies still walk the streaming streets: Back in 2013 I ruffled a few feathers highlighting the issue of zombie subscribers, music subscribers that are recorded in the headline numbers but that are actually inactive, normally because they are on telco bundles. Fast forward to 2016 and the issue is more firmly in the public domain due to Deezer’s IPO filings. Zombies coupled with overstating by music services accounted for around 12 million subscribers in 2015 so the active ‘actual’ subscriber number was nearer 55 million. Emerging markets are gaining share: Emerging markets will play a key role for streaming over the next few years. They are already driving growth for Apple and Spotify and they will collectively bring the most dynamic growth with western markets nearing saturation for the 9.99 price point. Much of the growth though will come from indigenous companies, such QQ Music (China), KKBOX (Taiwan), MelOn (South Korea) and Saavn (India). Free still dominates: For all the scale of of subscriptions, free still leads the way with free streaming services accounted for nearly 600 million unique users (1.3 billion cumulative users if you add together the user counts of all the services). Free thus outweighed paid by a factor of 10-to-1. Streaming must overcome its identity crisis. Depending on where you sit in the music industry, streaming is either the future of retail or the future of radio. It can be both, but there is increasing pressure for it to be retail only. That would see only a fraction of the opportunity realised. Throughout its history, a small share of people have accounted for the majority of spending. Casual buyers and radio accounted for the rest. 17% of music buyers account for 61% of spending. These are the people who are either already subscribers or that will become subscribers over the next couple of years. Which leaves us with the remaining 83% of consumers. The majority of these listen to radio while a growing minority use free streaming (mainly YouTube). The question the music industry must now answer is how seriously does it want to treat the opportunity represented by these consumers? Does it want to only serve its super fans or does it also want to be global culture? Radio enabled music to be global culture in the 20th century, free streaming will enable it to be in the 21st. This is why the free streaming debate is important but also so complex. Yes, too much free music will curtail the opportunity for paid subscriptions, but too little could consign music culture to the margins. 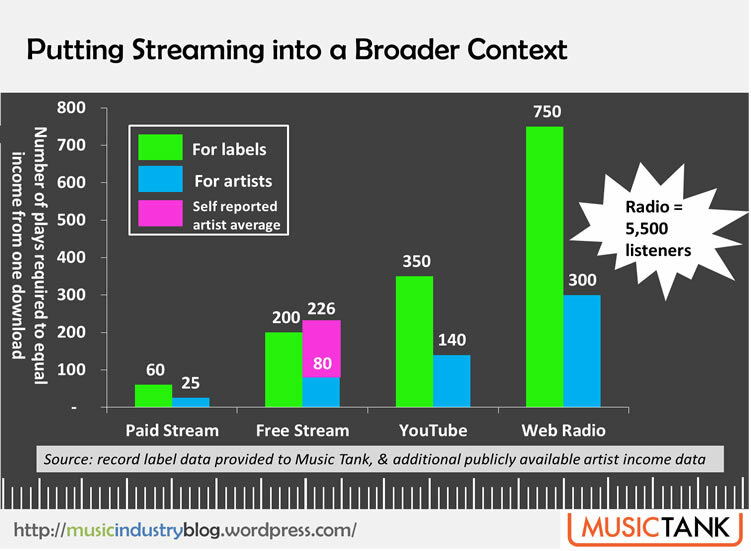 With streaming there is an opportunity to monetize a bigger audience at higher rates than radio ever enabled. 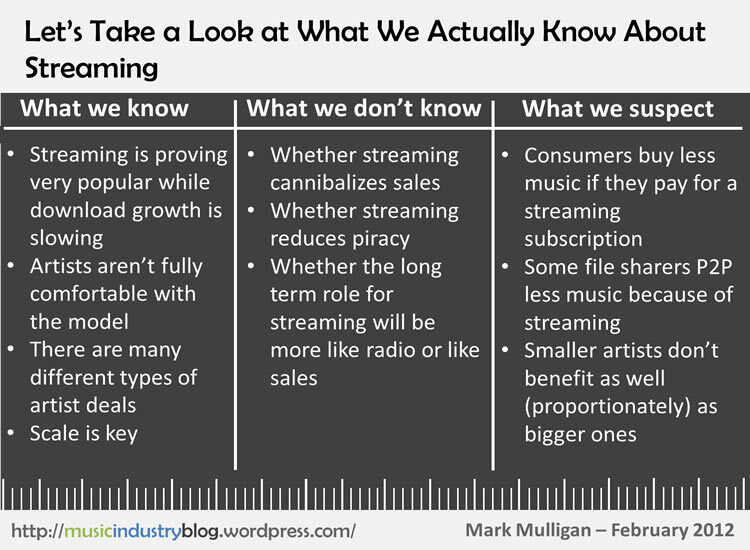 At the moment free streaming bears the burden of being all about driving sales (either subscriptions or music purchases) but that misses the far bigger opportunity for free in the streaming era: mass monetization. What we have now is a dysfunctional system. Freemium services have licensing minimas (the minimum that must be paid per stream) that effectively prevent them from building profitable ad supported businesses, while YouTube has licenses unlike any other but is the industry’s bête noire. Only Pandora has a model that is both (largely) acceptable to the industry and (theoretically) profitable. I say, ‘theoretically’ because Pandora could get towards a 20% margin if it wasn’t investing so heavily in ad sales infrastructure and other companies. Out of those three disparate models an effective middle ground can and should be found so that the streaming debate becomes one of free AND paid rather than free VERSUS paid. Then we will have the foundations for creating a market that enables subscriptions to thrive within their niche and for global audiences to be monetized like never before. 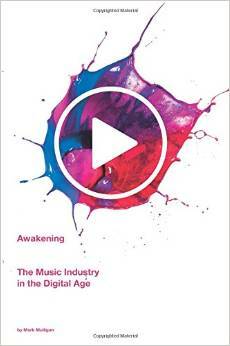 Regular readers will know that I recently published the Kindle version of my book “Awakening: The Music Industry In The Digital Age”. Many of you have already bought it (thank you!) but some of you also wanted to know when the paperback edition was going to be available. Well you need wait no longer, you can buy the paperback version of ‘Awakening’ right now by clicking here. If you are interested in the music industry then this is the book for you. Whether you are a label executive, music publisher, artist, songwriter, entrepreneur or simply interested in what you can learn from the music industry’s experience and want to know what the future holds then this is the book for you. And if you’re still not convinced, take a read of the sample chapters on Amazon. ‘Awakening’ is also available on iTunes and Google Play. I hope you find the book as interesting to read as I did writing it. 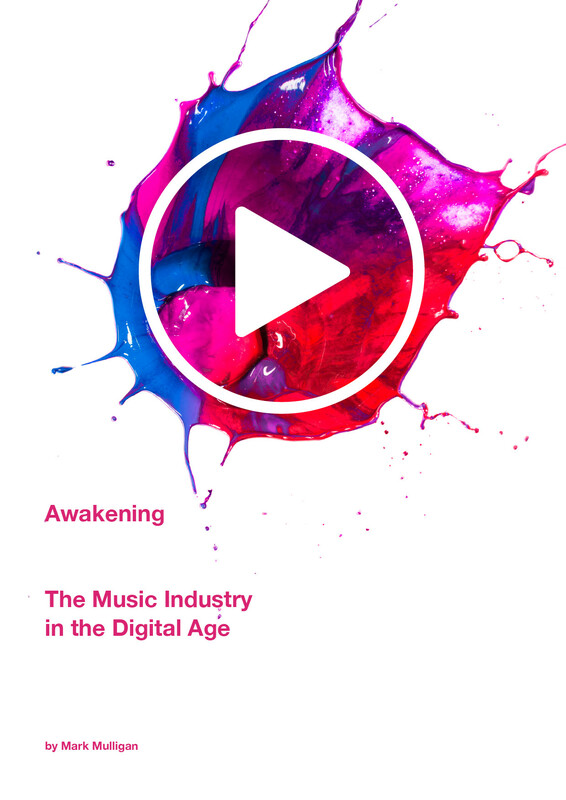 The music industry is on the brink of an utterly transformative period of change that will result in the creation of an entirely new industry tailor made for the digital era. ‘Awakening’ presents the vision of how and why this change will come, what this future will look like and how the first steps on the journey are already being taken. The book includes interviews with 60 of the music industry’s leading figures, including globally successful artists and more than 20 CEOs (a full list of interviewees can be found at the bottom of the page). Alongside the insight from this unprecedented executive access, ‘Awakening’ uses exclusive consumer data, official market statistics, proprietary models and multiple additional data sources. 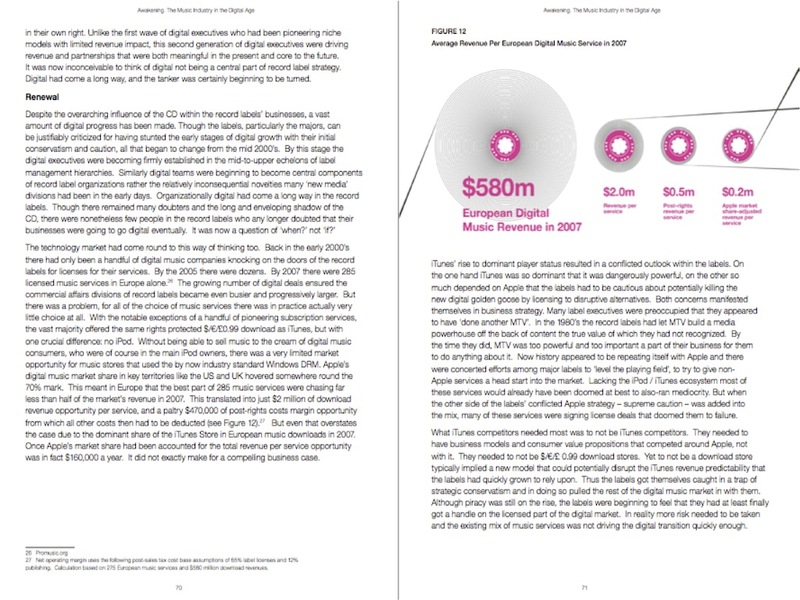 In doing so it constructs an unparalleled picture of the new global music economy presented across 60 charts and figures. All good stories start in the beginning. ‘Awakening’ deconstructs the failed state experience of the analogue era music industry with the definitive account of the music industry’s transition from booming $28 billion powerhouse to today’s much humbled $15 billion business. Music fans used to be told what to listen to when, where and how. In the new music industry the balance of power lies with the fans with themselves. The old music industry had the record labels at its centre, the new digital era industry will have the consumer at its core. The change will be generation defining and will transform forever what it means to be an artist and a fan. Livelihoods will be destroyed, others created, millionaires made, culture transformed. The change is already underway. ‘Awakening’ looks at each individual component of the music industry today and looks at each one is dealing with change and preparing for the future. From the superstar artist to the small independent label, from the pirate company CEO to the major label CEO, in the book I explore the incredibly varied picture of confusion and innovation, uncertainty and brilliance, fear and confidence. Most of all it is the story of a rebuilding, an Awakening of the new music industry. I was extremely fortunate to interview many of the most important figures in the music industry of the last 15 years, including CEOs of major record labels, CEOs of all the major streaming services and platinum selling artists. 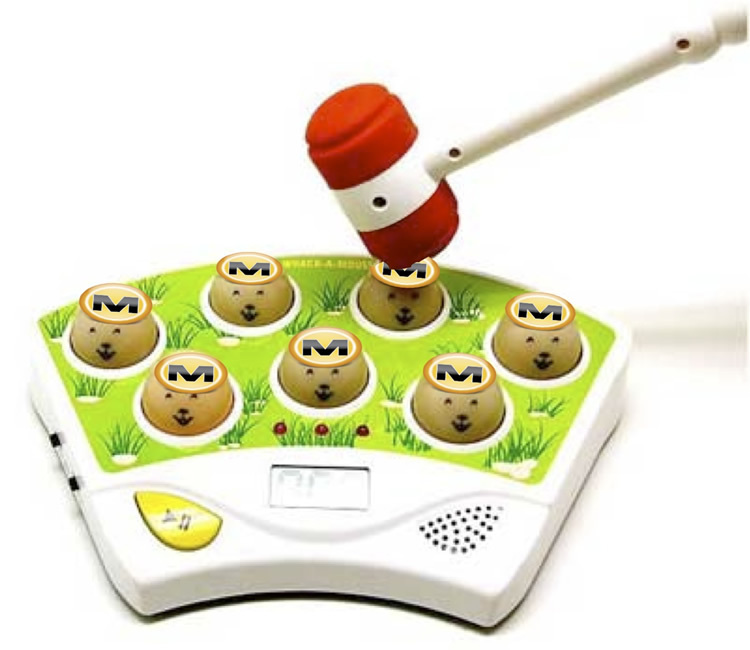 I’ve managed to get the inside track on exactly what was happening behind the scenes. I personally learned a huge amount while writing this book and I am confident virtually every reader will do so too. In short, once you have read this book you will know practically everything that there is to know about the digital music market and where it is heading! For anyone interested in the music industry and the lessons it provides for all media and technology businesses in the digital era, this is the only book you will ever need. The book is available now on Amazon and iTunes and Google Play. Also 10% of net profits will go to the music therapy charity the Nordoff Robins trust. Note: positions either refer to current position held by interviewee or key position held during the narrative of this book. Last night I participated in a Music Tank seminar on streaming music. It was a vibrant and valuable debate with a healthy diversity of opinion. Below are brief highlights of my opening keynote, including some exclusive data from record labels and from Spotify. Streaming is no new thing. Napster, Rhapsody, YouTube have been with us for many years. What changed is that Spotify made it work with elegant simplicity, wrapped up in a consumer-friendly value proposition. Of course Spotify had timing on its side too, coming to market once most of us already had broadband and at a time when a rapidly growing share of us were getting smartphones with data plans. And of course timing is everything in business. Timing aside though, we should be careful not to get hung up on the idea of streaming as an alternative format to the download. It is not. It is simply a different delivery mechanism for digital music, and when you factor in cached streams the distinction blurs further. Streaming versus downloading is tech speak. All music fans are interested in is being able to listen to the music they want, when they want, where they want. Streaming music, and Spotify in particular, has been cause of much controversy and debate of late. I’ll come on to some of the causes later but it is first worth taking stock of what we actually do and don’t know about streaming. What we know. Streaming is proving popular with consumers at a time when download growth is slowing. But many artists are not fully comfortable with the model and feel that they don’t get a fair enough deal. A dynamic which is complicated by the fact there are many different types of artist deals. Scale is key to streaming being successful (you don’t make money off dozens or hundreds of streams). What we don’t know. We don’t know yet whether streaming cannibalizes sales. Whatever data you see on either side of the argument we are simply too early in the evolution of streaming to draw conclusions. There simply isn’t enough empirical data. We need a few more years yet and even then separating cause from effect is challenging at best. What we suspect. It is looking like streaming does help reduce the amount people use file sharing. Again, the evidence isn’t definitive and there certainly isn’t sufficient evidence to suggest that the number of people using P2P etc is declining due to streaming, but intensity of usage perhaps. Smaller artists don’t seem to do that well out of streaming. Any new technology looks more like what came before than what will come next. After all we only have the past and present as our reference points. 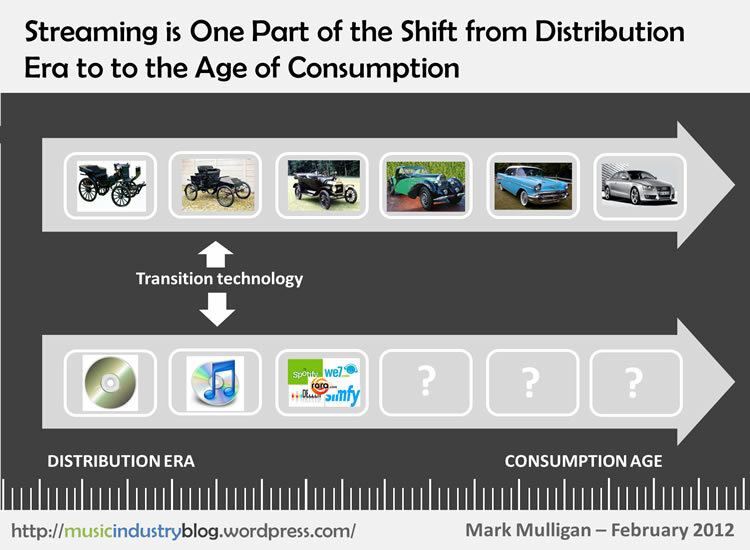 Thus when a new set of technologies emerge they begin with transition technologies. The first car was a steam powered horse-less carriage (see figure 2). It was a transition to the first internal combustion engine vehicle and it wasn’t until the 1950’s that we really started to see automobile form factors that had fully thrown off the horse drawn carriage heritage. Digital music is no different. The download was the steam powered horse-less carriage, a really useful transition tool to help us bridge the gap between analogue and digital, but just that. Access based services are the first steps towards the internal combustion engine, services that leverage some of the unique capabilities digital presents, rather than just using the web as a delivery mechanism. But it is still very early days, we are not even at the Model-T yet. 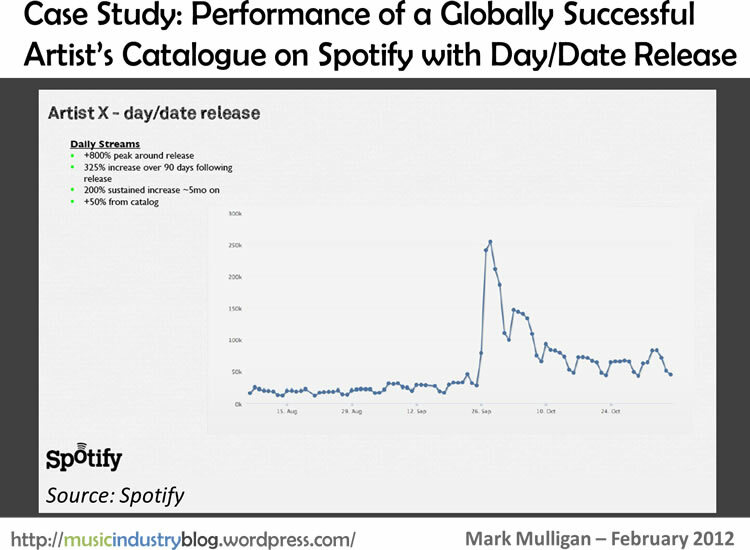 Spotify also put some data on the table (see figure 4) showing how a major global artist’s catalogue fared following the release of their album the same day to stores as to streaming. Obviously this data is positioned in the context of the cannibalization and ‘windowing’ debates (which I’ve contributed to here). The data doesn’t prove anything either way in terms of cannibalization (i.e. it could be interpreted as streaming activity does well when an album does well or it could also be viewed as lost buyer activity). However it does make a compelling case for the degree to which an artist’s back catalogue can be significantly boosted on streaming following an album release. There are some well voiced concerns that streaming favours big name artists, the head rather than the long tail, but if it does then it appears to do a good job of mining the long tail of the head! 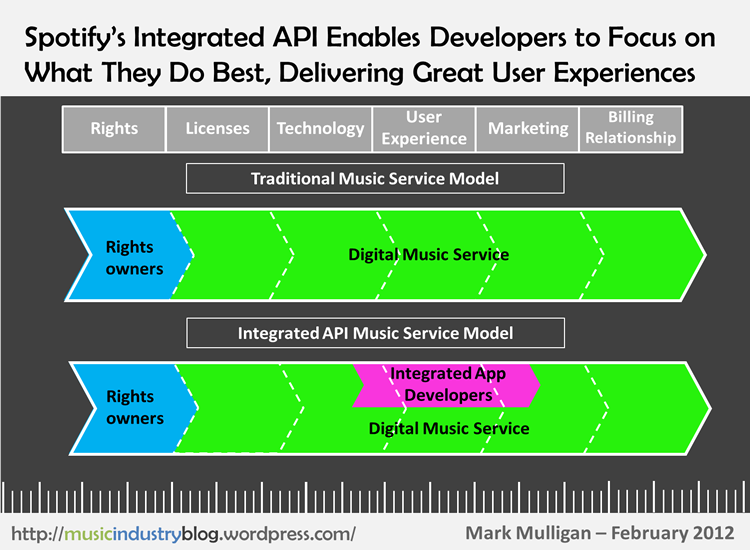 The potential of Spotify’s Developer API strategy: an API for Music? In the last 6 months digital music has two developments of potentially seismic proportions that through their subtle brilliance many haven’t yet appreciated their actual importance. One was Facebook’s content dashboard strategy. The other was Spotify’s Developer API. Of course APIs are no new thing, but if Spotify can reach a hundred million plus total users then its API has the potential of becoming a de facto API for music. Allowing developers to skip seeking licenses from rights owners and using Spotify’s instead. It is a crucially well timed move, coming just as investors are turning away from investing in services that require licenses (you may have noticed by now that impecable timing is one of Spotify’s strengths). Investors have tired of funding license advances for services that often, as in the case of Beyond Oblivion, don’t even make it to market. The labels still get their digital income but investors are left with a debt write off. Index’s highly influential Saul Klein went as far as stating that he won’t even invest in start-ups that require rights owner licenses. Crucial to the streaming debate is making the right comparisons. But Streaming does = (download + radio) ÷ ?? The exact balance is in flux but the conversation must recognize that a direct comparison with either is off the mark. What we don’t yet know, and won’t for a couple of years, is whether streaming is pulling its users from green field and thus growing the market in a truly additive manner, or whether it is instead catalysing the organic digital transition, converting those consumers who would have gone digital anyway. If it is the latter then questions about the income from streaming users compared to other digital customers becomes a more pressing one. If it is the former then it frees us up to look at the scale picture with fewer reservations. If these customers simply weren’t ever going to adopt a different digital service then we can start to discuss how low we can bring pricing to drive even great numbers. The elephant in the room is that £/$10 is just too much for mainstream consumers. It needs to be close to £/$5 to really break into the mainstream. And you can only make that business case with genuine scale. As for the legacy of streaming? 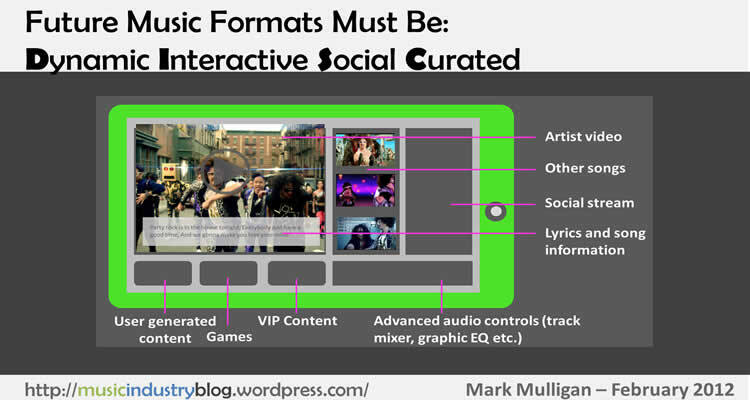 Streaming will help make Facebook the most important player in the digital music market by 2013. For those of you who weren’t able to make it to Midem last week here are the text and main graphics from my Midem Visionary Monday speech. 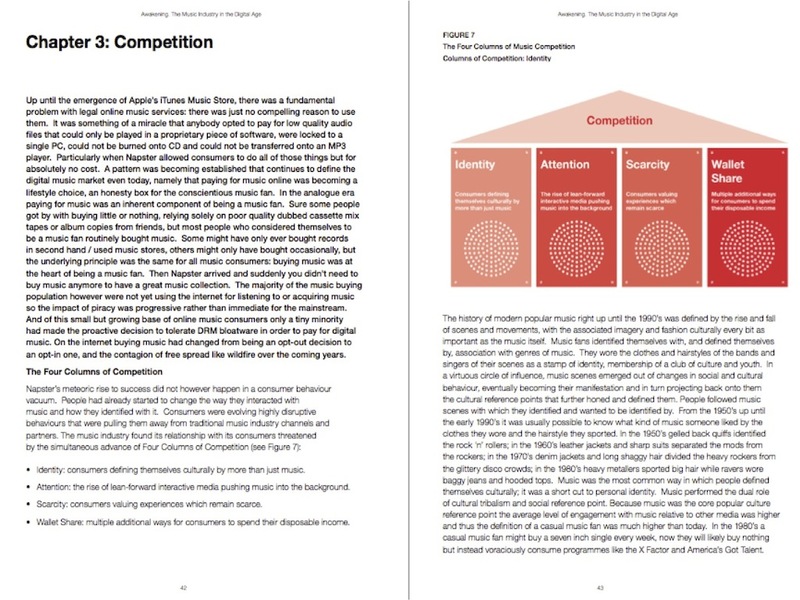 Today I want to talk to you about a concept called Agile Music, a framework for understanding how artist creativity, industry business models and music products must all undergo a programme of radical, transformational change. I’m going to start by outlining the catalysts for this change. This time last year on this very stage I argued that the digital music market was at an impasse, that momentum was seeping out of the space at an alarming rate. Unfortunately 2011 lived up to the pessimistic billing. The market further consolidated around the Triple A of Apple, Amazon and Android and digital revenue growth remained stuck in single digit rates. The simple fact is that the digital music market should be hitting hockey stick growth curves by now. And don’t think that hockey stick growth curves only exist in the crazy minds of industry analysts, take a look at this chart: hockey stick growth rates are what the music industry itself used to be used be based on. 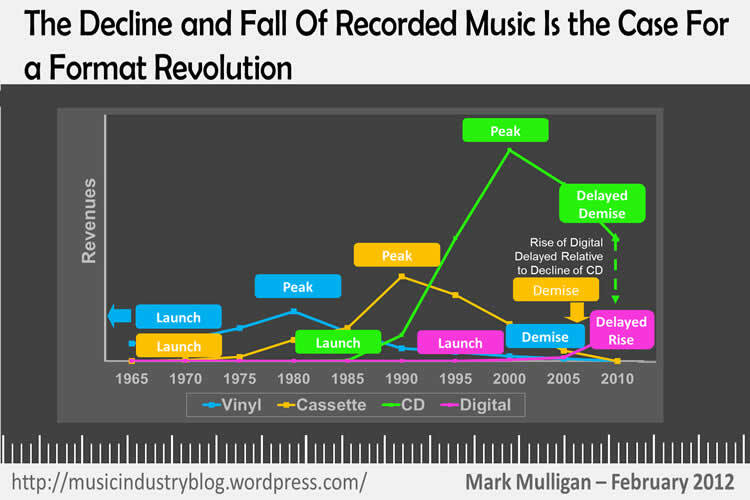 This chart also reveals a crucial fact: each time an analogue music format went into decline its successor was already firmly in the ascendency. The same is patently not true of the digital products and their failure to generate a genuine format succession cycle is dragging the whole market down. So we had a year once again defined by declining revenues. And though streaming (especially Spotify) had a fantastic year, we saw the emergence of the debate over whether access based streaming services cannibalize ownership. The third key trend of 2011 was the emergence of new ecosystems to challenge the dominance of Apple’s iTunes. Ecosystems from Facebook, Spotify, Amazon, Android. 2011 also saw the first real stirrings of three key trends which will shape 2012: firstly, Social listening: a niche activity thrust into the mainstream by Facebook’s subtly brilliant content dashboard strategy. Open innovation, supercharged by age of the API and connected consumption, powered by increasingly ubiquitous connectivity. These three trends are also the fundamentals of Agile Music. And so, onto Agile Music itself. 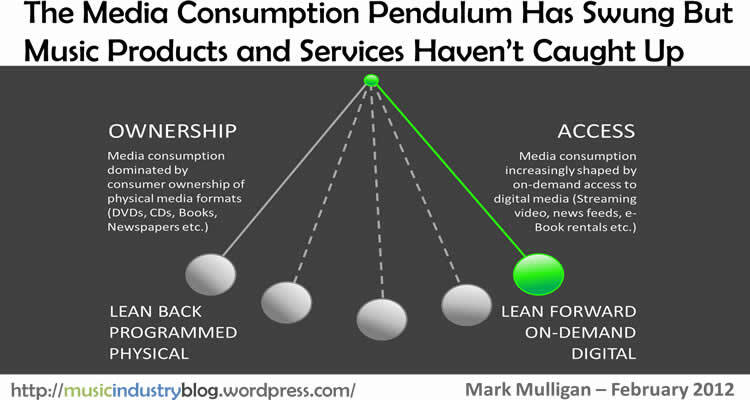 The access / ownership debate is in fact just one part of a much wider transition in content consumption. In the analogue era media consumption was characterized by ownership of linearly programmed physical formats that we leant back to consume. In the digital age we lean forward, interact and value access. 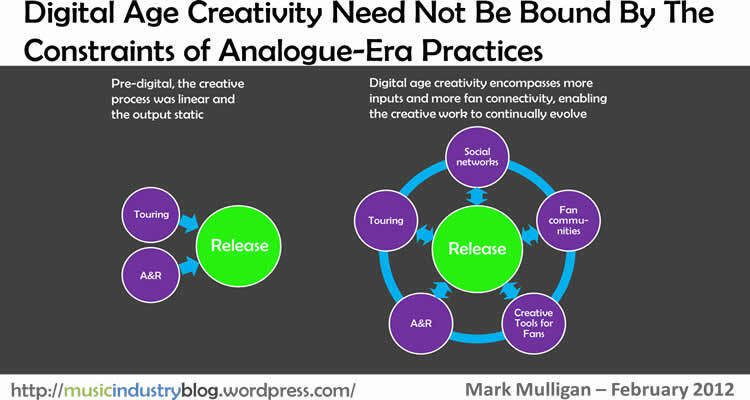 A new generation of music formats is needed that are built for the digital age rather the current ones which essentially squeeze the analogue square into the digital circle. But just in the same way that HD TV and 3D movies need new content, this new wave of products needs to be built upon an entirely new approach to artist creativity. Analogue-era music formats shaped artist creativity. In the 50’s artists recorded singles, in the 70’s 8 song albums, in the 90’s 14 song CDs. In the 21st century, well for some reason they’re still recording 14 song albums. When of course there is no music format reason for them to do so anymore. The other big change is that artists now have at their disposal a much wider range of creative inputs into their music, such as fan forums, social networks, fan remix apps. Inputs that should be harnessed in a structured manner rather than the ad hoc approach which currently dominates. And don’t mistake these inputs for just being marketing opportunities, or tactics for boosting ‘engagement metrics’. They are genuine windows of creativity that artists and their labels simply cannot afford to ignore. 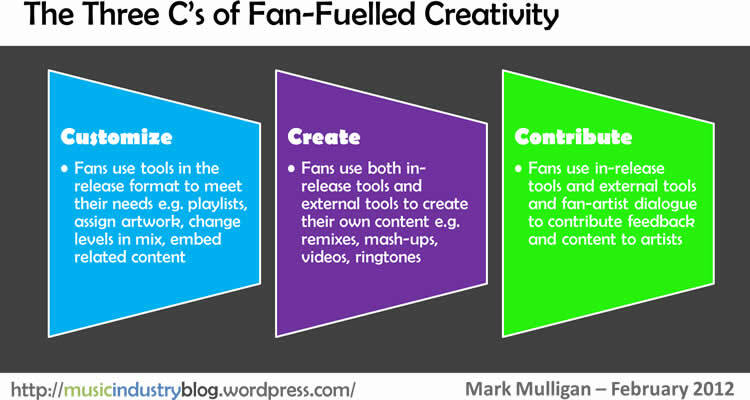 This fan input comes in three key forms, what I call the three Cs of fan-fuelled creativity: Customize, Create and Contribute. The degree of fan participation ranges from modest on the left, to deep on the right, because of course all fans are not the same. 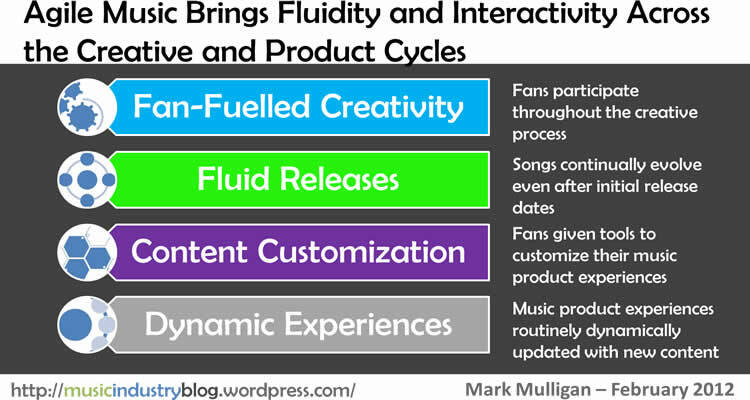 These three levels of fan engagement need embedding into the creative process , which you’ve probably realized by now, means a much deeper level of participation for the average artist. I’m not suggesting that everyone has to become Imogen Heap, but the needle certainly needs shifting further along the dial from where it currently sits. Agile Music means embracing fan fuelled creativity; it means breaking free of the straight jacket of the 14 track album and releasing music when it is ready; it also means releasing some of it before it is ready, to let fans help shape the music . Agile Music means allowing music fans to customize their music experiences, and for those music experiences to be dynamic and ever changing, free of the stasis of physical media formats. But a vibrant future for music products and revenues can only occur with networked collaboration right across the music industry’s various value chains. Artist, labels, developers, technology companies, telcos all need to pull together to create a generation of music formats that will be a genuine successor to the CD. This collaboration is needed, and it is needed now, because what I am proposing here is merely verbalizing what consumers already expect. 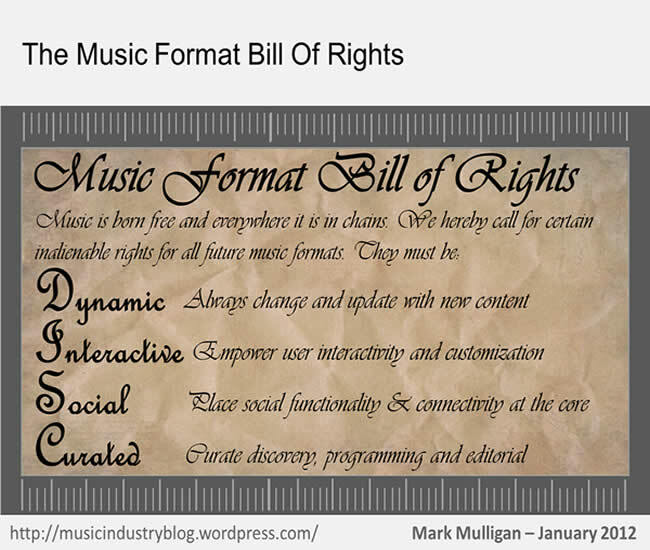 And this is why the future of music products must be built upon a consumer centric Music Format Bill Of Rights, which can be defined by four key principles: Dynamic: they must always change and update with new content (the format stasis of the download and the CD need consigning to the history books); Interactive: empower consumers to participate in their music experiences; Social: music has always been social, now it is massively social and music products must place this at their core; Curated: the curation of dynamically updated music content will not only be part of the key value, it will become part of the creative construct itself. Now the irony of these principles spelling that most physical of terms DISC is intentional, but make no mistake, these are the basic building blocks that any new music product must contain if it is to have any long term viability. And to whet your appetite here’s a glimpse of what a DISC product should look like. It looks a lot like an app experience and for good reason. The future of music products will be app-like experiences. . DISC products will leverage the potential of apps to deliver rich, curated streams of artist content incorporating everything from photos, interviews, games, outtakes, remix apps through to core music audio and video itself. But the central value of DISC products will come from how they are out together. It won’t matter whether kids upload elements up to Rapidshare or Torrents, the value will lie in the uniquely curated context of the product, just as our favourite magazines and websites deliver a value as a whole which is much greater than the sum of their individual parts. And not only do DISC products compete with piracy, they mitigate the access / ownership debate. Because DISC products will be artist specific. Music fans will buy DISC products for each of their favourite artists and then use streaming services for the rest, thus solidifying a complementary and additive role for streaming. A fan will pay to get everything their favourite artist does for the next 18 months, delivered directly to all of their devices (and I do mean to all of their devices because we are in the per person age, not the per device age, and it is time for licensing practices to embrace this reality). Now I know that a lot of this is easy enough for me to lay out here on stage but complex to implement. However the stakes are high enough to justify the sizeable effort. 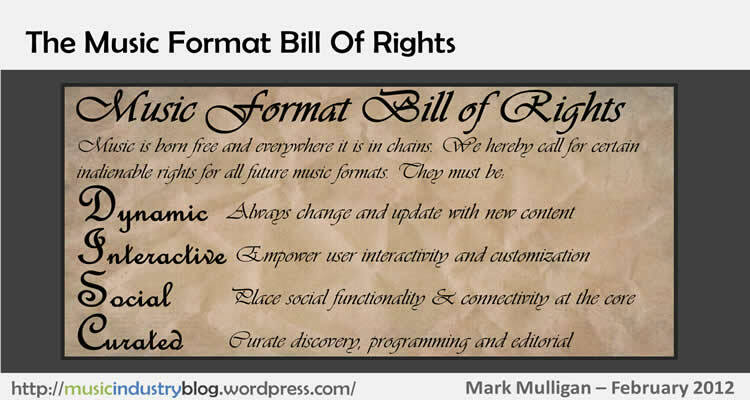 The next generation of music formats needs to be dictated by the objective of meeting consumer needs, not business affairs teams’ T&Cs. It must be defined by consumer experiences not by business models. The cart’ of commercial terms, rights complexities and stakeholder concerns must follow the ‘horse’ of user experience, not lead it. Release Windows, the Cure for the Access vs Ownership Debate? Back in early 2009 when I was at Forrester Research I wrote a report proposing that the Music Industry should adopt release windows. It seemed to many something of an anachronistic concept, written just at the time with the Movie Industry – that bastion of release windows – was deeply engaged in a dialogue about compressing windows. But now, with the growing debate over whether streaming services are cannibalizing CD and download sales, the idea is beginning to look highly relevant. Because the simple fact is that a structured release window strategy for the music industry would do away with much of the access versus ownership debate once and for all. All of the new releases would go straight to Window 1 and be available there, and there alone, for a 2 week period, with terrestrial and digital radio coming after that. This is a contentious point as radio is of course intended to act as a discovery and marketing tool but the time has come for the top tier of the music product pyramid to be held up as exactly that. After all, why should passive music fans who don’t pay for music get to hear new songs as soon as those who pay 9.99 a month or buy downloads or CDs? Users of free ad supported streaming services would have to wait a full 4 weeks before they get to hear the latest new music. The problem with differentiating a free stream from a paid download is that there simply isn’t that much difference. Release windows however, put clear blue water between the download and the free stream. Coldplay’s decision to keep ‘Mylo Xyloto’ off Spotify until album sales have peaked is effectively artist level windowing in practice. The alternative strategy of just putting the odd track on there – such as Adele’s ‘Rolling In The Deep – treats streaming as a radio-like promo vehicle but if all artists did that then its promotional value would soon disappear as people would stop using streaming services. A structured, industry level windowing strategy however would bring consistency and effective results. Of course the windowing approach isn’t free of problems. For example pushing radio to the second window will require a new approach to marketing music and a revision of assumptions of sales cycles. However both of those things are already in effect happening, forced along by the current streaming status-quo, and of course unlicensed free music. Windowing is an opportunity for record labels to take control of the situation and simultaneously protect music sales and define a long term, complementary role for streaming services. The alternative is a prolonged and unproductive debate about cannibalization that will cause deep fault lines across the music industry and may ultimately kill off streaming all together. By utterly amazing coincidence, ahem, just as the US Congress is considering Sopa and Pipa, cloud locker service Megaupload gets closed down and its top executives arrested and refused bail. The timing is of course important, but nature of the media industries’ latest scalp is even more intriguing. Megaupload, along with Rapidshare, Filestube and other such services, has been more than a thorn in the side of media businesses, it has been making tens (perhaps hundreds) of millions of dollars of annual revenue by essentially sticking the middle finger up at copyright owners. Megaupload’s closure has wreaked the wrath of the hacker community with Anonymous taking down various sites in retaliation. But Anonymous’s anger is misjudged. This is no blow against Internet Users’ rights, and Megaupload is no evangelist for the hacker community. Napster’s Shawn Fanning thought he was changing the world, the Pirate Bay’s Peter Sunde thought he was leading a revolution in copyright. But Megaupload’s Kim Schmitz (aka Kim Dotcom) had no such ideals, for him it was all about the cash. Just take a look at the opulent excess of his mansion and fleet of luxury cars with registration plates such as ‘Mafia’ and ‘CEO’. Schmitz earned his wealth not just through advertising but also by charging users premium fees for better download speeds, thus charging people to download illegal content. Megaupload et al are an interesting anachronism in the digital piracy landscape. The overriding trend has been for piracy destinations to get more sophisticated and more difficult to tackle each time the media industries take a step forward. Think darknets, encrypted P2P applications, anonymous networks etc. Commercial locker services though are easy targets, typically with central servers and clearly defined commercial operations. If anything, it is surprising that it has taken so long to get Megaupload taken down. But as with any piracy victory for the media companies, the sweet taste of triumph will be short lived. Close down one upload site and another one will arise. In fact there are already alternative IP addresses for Megaupload circulating around Twitter. So Megaupload’s takedown is simultaneously a landmark victory and just another furry head smacked downwards in the never ending game of digital-piracy-whack-a-mole.